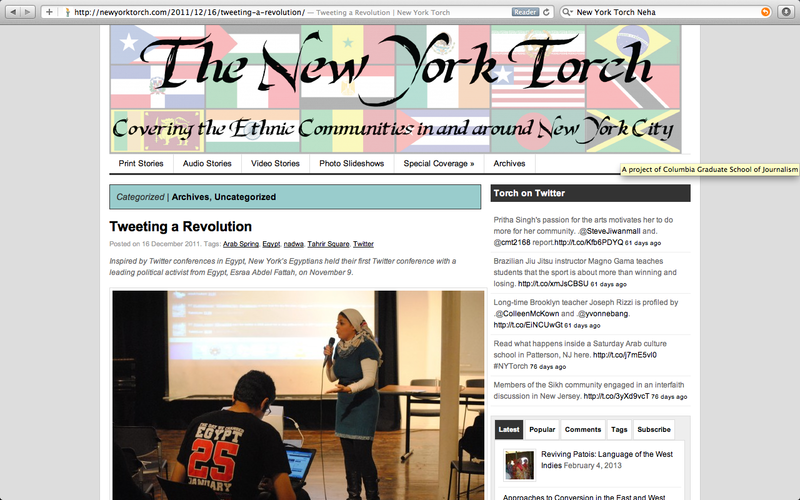 While following the news on Egypt nowadays, I am reminded of the first Egyptian Tweet-athon I covered in 2011, when I was covering the Egyptian community in New York as part of my Journalism school coursework. Egyptian political activists in the city have found unique ways to connect with their counterparts in Egypt — and take the revolution forward. Here is the story that I wrote. It was published in The New York Torch. Last Wednesday, Darin Sawan, a freshman at Queen’s College, took the subway to the non-profit Alwan For the Arts in Manhattan with an unusual agenda: she would speak for exactly 140 seconds about Egypt, the country she left as a six-year-old, and then tweet her discussions with the audience in exactly 140 characters. Sawan was part of New York’s first Tweet nadwa — literally, a conference in which Web 2.0 enthusiasts take turns to speak on an issue and then tweet about it so that their discussions reach a large number of people. Tweet nadwas have gained currency in a post-Hosni Mubarak Egypt, with the smartphone-toting revolutionaries who brought down the three-decade long dictatorship swearing by the power of 140 characters to bring about political change. The New York chapter of the Egyptian Association for Change created a special hashtag on Twitter to tweet the event: #TwNadwaNYC. The evening assumed special significance because it came just three weeks before Egypt’s first parliamentary elections to be held after Mubarak’s ouster. After weeks of a sustained campaign, Egyptian-Americans had won the right to vote in the elections; the nadwa, therefore, was themed on the forthcoming polls. Kicking off the nadwa was one of the most prominent faces of Egypt’s social media revolution: Esraa Abdel Fattah. Fattah, 33, was in town to receive Glamour magazine’s Woman of the Year award. She was being honored for being one of the pioneers of the Arab Spring, and tweeting and Facebooking Egypt’s revolution as it unfolded on Tahrir Square. For Sawan, who is majoring in political science, there was no better person to tell her what the political situation was like on the ground in Egypt. “I feel there is a plethora of parties in Egypt with the same ideas and opinions. Why can’t the background noise come together to form one loud voice?” asked Sawan in her 140-second time slot. Fattah helped Sawan quantify the parties: “After the revolution, there were 73 parties. Now, many of them have merged to become five,” said Fattah, as fingers flew across the hall on Twitter feeds on iPads, cellphones and laptops. Fattah overshot the 140-second rule in urging the expat Egyptians to cast their ballot. Tweets in both Arabic and English appeared on the screen behind her at a dizzying speed. “Get educated, know the candidates, follow campaigns that exposes the candidates from old regime,” read one. Soon, no one seemed to remember that they were allowed to speak for only 140 seconds each. The gigantic darting digits on an iPad stopwatch held by conference organizer Zaid Saleh on stage were lost on the audience. Not everyone shared Fattah’s enthusiasm for the forthcoming elections. “How can we trust the military council that is organizing elections? We have a lot of broken promises from it. These elections will be a sham,” said Mina Ibrahim, a fitness instructor and psychology and political science major at the City College of New York. Diasporic Egyptians asked each other how they could make a difference to the emerging Egypt – outside of the electoral process. “Many of us want to invest in Egypt but are lost,” said Amro Ali, a former diplomat from Canberra. “I have met Egyptians in England, Denmark and Germany who have no organization to direct them,” he added. For many nadwa participants, tweeting their discussions was a way of sending a message to fellow Egyptians back home. “I want to reassure them that those of us living abroad haven’t abandoned them,” said Sawan. Fattah had another takeaway from the nadwa. “I learnt that Egyptians here are even more politically aware than us in Egypt. They are certainly more revolutionary than us. Some people here already want to make another revolution in Egypt,” she said.